About two years ago, California’s governor, Jerry Brown, signed SB277 into law, which mandated that all school age children must have all vaccines appropriate for their age before they could enter private or public schools. The law nearly eliminated the ability to get personal belief exemptions (PBE), which allowed parents to object to vaccinations for almost any reason. The new law does allow for medical exemptions, that is, children who have some medical condition that contraindicates a vaccine may be exempted from these rules. As a result of this law, it was predicted that the California vaccine uptake for school age children would increase substantially, while reducing the incidence of vaccine preventable diseases. Those of us who have been keen observers and supporters of SB277 were hoping for the best – that the vaccination rate in the state would show increases quickly. And it did. 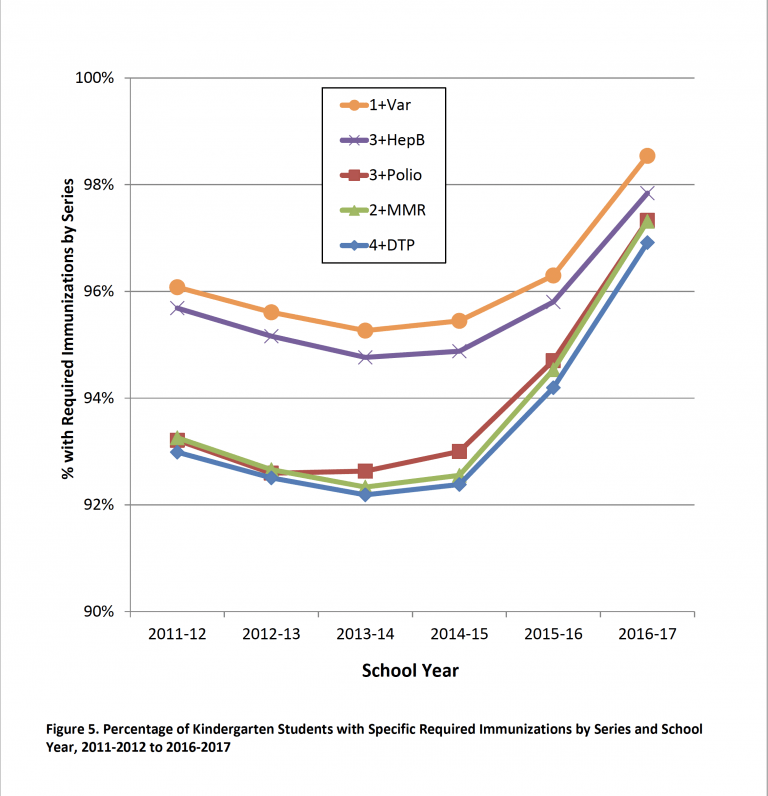 Data released this week (pdf), from the California Department of Public Health, showed an exceptional increase in the percentage of California’s kindergarteners who were fully vaccinated (for their age group) – it rose from 92.8% to 95.6%. But, there’s even more astonishing data underneath that. 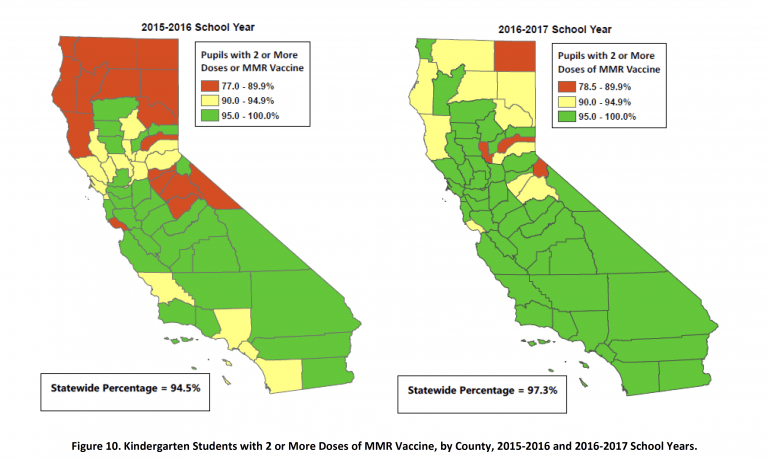 With the advent of the new law, 97.3% of California’s kindergartners have received both MMR vaccinations, up from 94.5% in 2016 and 92.6% in 2014. The same was shown for diphtheria, tetanus and pertussis (whooping cough) vaccine – it went from 94.2% in 2015 to 96.9% in 2016. There should be cheering in the streets of California for the success of SB277. The best part of the law is that it’s increasing vaccine uptake in areas of the state where the overuse of PBEs was pushing the vaccination rate down. Most California’s counties have vaccination rates above 95%, which is considered the level at which the herd effect for measles vaccinations prevent the rapid spreading of the disease. Furthermore, only 4 relatively small counties in California have rates below 90%. California state Senator Richard Pan (D-Sacramento), who is also a pediatrician and who was one of the primary supporters of SB277, tweeted out “Great News.” Obviously he’s ecstatic with this data on California vaccine uptake across the state. Measles certainly hasn’t gone away. We need to be sure to have our immunization levels high enough. The fact that this class and the state overall has now achieved this level is one further step to restore the community immunity we had before. He also noted that the data shows the significant increase in very young children, kindergartners. He mentioned that there are still significant number of older children who are not vaccinated because of the lax requirements in previous vaccine laws, which made PBEs very easy to get. SB277 also requires 7th graders to be completely up-t0-date on their vaccines, so all children should eventually be caught up with their vaccines. Unfortunately, many students who have passed that 7th grade vaccination checkpoint may be insufficiently vaccinated. Or not vaccinated at all. The University of California (UC) system has stated that it will require vaccines for all new enrollees at its 10 campuses (along with the UC Hastings College of Law which has decided to comply with the UC requirements). Like the state law, it eliminates all personal belief exemptions, but does allow medical ones. Eventually, this mandate will cover the over 230,000 students in the system. The anti-vaccine forces have tried several tactics to block implementation of the new law. Opponents of SB277 filed a lawsuit last summer claiming the law violated California children’s right to an education under the state’s Constitution. A judge denied their demand for an injunction against the law – the plaintiffs eventually withdrew their case. These opponents also failed to gather enough signatures last year to put a referendum on the November ballot to overturn the law. Vaccine advocates in Colorado are envious of their counterparts in California. “We are watching California very closely, and kudos to them for getting that bill through,” Stephanie Wasserman, executive director of the Colorado Children’s Immunization Coalition, told BuzzFeed News. She believes it would be very difficult to enact similar legislation in Colorado, which has libertarian conservatives who reject government mandates on vaccines, as well as liberal enclaves like Boulder where many parents seek out alternative health care and see vaccines as a tool of Big Pharma. Libertarian conservatives and liberals on the same side of the fence on vaccines? The problem with both groups is that they ignore the health of children just to be “politically virtuous” about vaccines. Except they are scientifically and medically wrong. So let’s give an ovation for hard working politicians of California, who decided that the health of the state’s children was the paramount consideration for vaccinations. Dr. Pan and many other state legislators decided that the most effective way of increasing the California vaccine uptake was to reduce the availability of personal belief exemptions. And they were right – California’s immunization rate has increased appreciably because of SB277. Next PostNext Vaccine court jury – is there a constitutional right in NVICP cases?